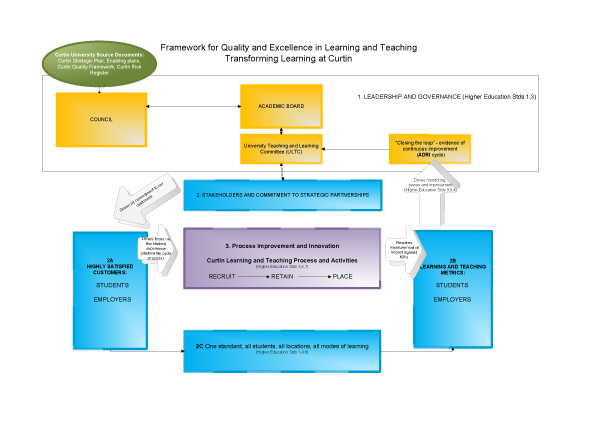 This framework has been created to present an overall structure for quality and excellence in learning and teaching. This approach is based on Quality Management principles, i.e. : management builds the ideal approach from the beginning and continues to improve its overall approach. Quality assurance is simply a means of ensuring that what is intended is actually delivered. Curtin Learning and Teaching, in developing and evolving the Transforming Learning at Curtin, is accountable to the University Learning and Teaching Committee (ULTC), which is a sub-committee of the Academic Board, which in turn reports to Council. It is important to be aware of management’s responsibility for the development and management of projects and the Academic Board’s overall governance responsibilities through its various committees. Transforming Learning at Curtin is driven by a commitment to Curtin’s most important customers: its students and the employers who take students on placements and employ new graduates. There are other stakeholders who are significant players such as our staff (refer below). In order to deliver what students and employers need it is important that we focus on improving the critical processes within Curtin’s core business: Learning and Teaching and also Research. The Learning and Teaching processes are summarised under the major groupings of Recruit, Retain, and Place. It is only through process improvement of our core activities that we can be confident of achieving even greater results than we are now. To be confident of delivering improved outcomes, we are required to be measured against the University’s established targets – our key performance indicators. Through a focus on continuous improvement and using at least three year trend data, we are able to establish the evidence of improvement. Where there are shortfalls in achievement, action plans are developed to demonstrate how improvement will be made. These plans are submitted to UTLC along with other results to ‘close the loop’, ie to demonstrate that what we committed to is in fact being achieved. The relevant Higher Education Standards have been identified within each section of the Framework. It is interesting to note that Higher Education Standards pay particular attention to the Physical and Electronic Resources and Infrastructure to the extent that these assist with delivering student outcomes. There is also a built-in reminder that Curtin is far more extensive than its Bentley campus and that we need to be focussed on delivering the same high standard to all students, regardless of where they are based or their mode of study – a significant challenge in itself.